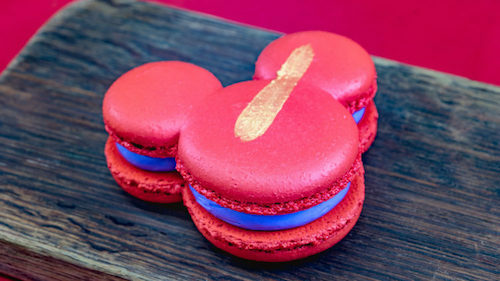 Disneyland Resort is celebrating Lunar New Year with Disney Magic and specialty eats available around Disney California Adventure Park now through February 17th. 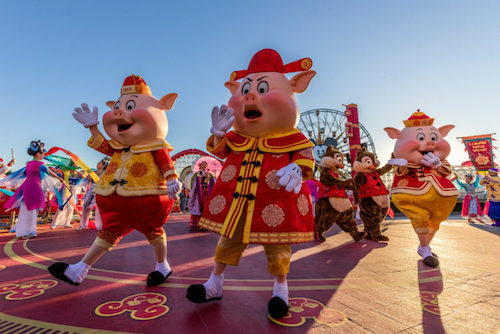 This is the Year of the Pig and at the park, during the special 24 days of this multicultural celebration; people visiting will experience exciting performances and live entertainment. An enhanced “Mulan’s Lunar New Year Procession,” fun arts and crafts, amazing décor, tasty cuisine and themed merch for the whole family will be available to enjoy as well. Even the Three Little Pigs join in the fun with a rare appearance. Some of the specialty cuisine will include; egg roll and seasame garlic noodles, stir-fried vegetables and pineapple with soy protein, steamed short rib shumai, whole deep fried tilapia, Mickey Chinese hot dog bun, Mandarin Orange-green tea tart, purple yam macaron with crème fraiche, and an orchid spritz beverage. The Mickey Chinese hot dog bun is shaped like Mickey and the purple yam macaron with crème fraiche are what I find most interesting that are being offered. 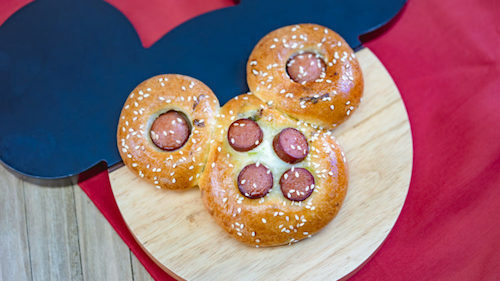 The Mickey Chinese hot dog bun looks great for posting to social media, like Instagram. •	“Mulan’s Lunar New Year Procession,” a bright and bold parade hosted by Mulan and her faithful dragon, Mushu, that honors Lunar New Year and celebrates family and friendship. As a special treat for the Year of the Pig, the Three Little Pigs (Fiddler, Fifer and Practical) join the procession in their full holiday garb, along with Goofy in his “god of Good Fortune” attire and Chip ‘n’ Dale in their red vests. “Mulan’s Lunar New Year Procession” is enhanced this year with a longer processional route, from Pixar Pier to Paradise Gardens Park, where guests will gather to watch the festivities. A troupe of Chinese performers bring additional dancers, martial artists and drummers to add extra excitement to the beautiful and colorful procession. •	Beloved characters Mulan, Mushu, Pluto, Mickey and Minnie donning their Lunar New Year attire and greeting guests at Paradise Gardens Park. •	Four Asian marketplaces offering delightful foods inspired by Chinese, Korean and Vietnamese cultures, all with a Disney twist. New this year is the Sip and Savor pass, available for any guest to purchase if they wish to get the best value as they taste their way through the festive Asian marketplaces. •	A special Lunar New Year menu at Paradise Garden Grill that offers items inspired by traditional Asian fare, plus a new Festival Food and Beverage Cart inside Paradise Gardens. •	Live, daily performances with authentic musicians. o	New this year, the Melody of China ensemble entertains guests with Chinese classical, folk and contemporary music, with a trio of artists that play the yangqin (Chinese dulcimer), pipa (Chinese lute) and Erhu (Chinese fiddle). o	Vietnamese artist Dat Nguyen plays traditional and original compositions on classical guitar, lute, flute and melodica at Paradise Garden Bandstand. •	An area for guests to try complimentary arts and crafts with local artisans, including Chinese calligraphy, paper lantern making and face painting. •	A Lucky Wishing Wall, where guests may add their own wishes for a wonderful future. •	Beautiful Lunar New Year décor, including ornamental lanterns and banners wishing guests a Happy Lunar New Year in English, Chinese, Korean and Vietnamese. •	New Lunar New Year merchandise inspired by different cultures of East Asia. o	Special items all the way from Shanghai Disney Resort, including traditional red envelopes for gift-giving, Minnie Mouse ear headbands, lantern glow wands and more. o	Commemorative items with Lunar New Year designs, including a limited-edition pin, adult hoody and tees.